Markets are a type of ecosystem that is complex, adaptive, and subject to the same evolutionary forces as nature. I read this article and found it very interesting, thought it might be something for you. 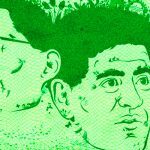 The article is called Complexity Economics Shows Us Why Laissez-Faire Economics Always Fails and is located at http://evonomics.com/complexity-economics-shows-us-that-laissez-faire-fail-nickhanauer/. During 2007 and 2008, giant financial institutions were obliterated, the net worth of most Americans collapsed, and most of the world’s economies were brought to their knees. At the same time, this has been an era of radical economic inequality, at levels not seen since 1929. Over the last three decades, an unprecedented consolidation and concentration of earning power and wealth has made the top 1 percent of Americans immensely richer while middleclass Americans have been increasingly impoverished. To most Americans and certainly most economists and policymakers, these two phenomena seem unrelated. In fact, traditional economic theory and contemporary American economic policy does not seem to admit the possibility that they are connected in any way. And yet they are—deeply. We aim to show that a modern understanding of economies as complex, adaptive, interconnected systems forces us to conclude that radical inequality and radical economic dislocation are causally linked: one brings and amplifies the other. If we want a high-growth society with broadly shared prosperity, and if we want to avoid dislocations like the one we have just gone through, we need to change our theory of action foundationally. We need to stop thinking about the economy as a perfect, self-correcting machine and start thinking of it as a garden. Traditional economic theory is rooted in a 19th- and 20th-century understanding of science and mathematics. At the simplest level, traditional theory assumes economies are linear systems filled with rational actors who seek to optimize their situation. Outputs reflect a sum of inputs, the system is closed, and if big change comes it comes as an external shock. The system’s default state is equilibrium. The prevailing metaphor is a machine. But this is not how economies are. It never has been. As anyone can see and feel today, economies behave in ways that are non-linear and irrational, and often violently so. These often-violent changes are not external shocks but emergent properties—the inevitable result—of the way economies behave. The traditional approach, in short, completely misunderstands human behavior and natural economic forces. The problem is that the traditional model is not an academic curiosity; it is the basis for an ideological story about the economy and government’s role—and that story has fueled policymaking and morphed into a selfishness-justifying conventional wisdom. Even today, the debate between free marketeers and Keynesians unfolds on the terms of the market fundamentalists: government stimulus efforts are usually justified as a way to restore equilibrium, and defended as regrettable deviations from government’s naturally minimalist role. Fortunately, as we’ve described above, it is now possible to understand and describe economic systems as complex systems like gardens. And it is now reasonable to assert that economic systems are not merely similar to ecosystems; they are ecosystems, driven by the same types of evolutionary forces as ecosystems. Eric Beinhocker’s The Origin of Wealth is the most lucid survey available of this new complexity economics. The story Beinhocker tells is simple, and not unlike the story Darwin tells. In an economy, as in any ecosystem, innovation is the result of evolutionary and competitive pressures. Within any given competitive environment—or what’s called a “fitness landscape”—individuals and groups cooperate to compete, to find solutions to problems and strategies for cooperation spread and multiply. Throughout, minor initial advantages get amplified and locked in— as do disadvantages. Whether you are predator or prey, spore or seed, the opportunity to thrive compounds and then concentrates. It bunches. It never stays evenly spread. Like a garden, the economy consists of an environment and interdependent elements—sun, soil, seed, water. But far more than a garden, the economy also contains the expectations and interpretations all the agents have about what all the other agents want and expect. And that invisible web of human expectations becomes, in an everamplifying spiral, both cause and effect of external circumstances. Thus the housing-led financial crisis. Complexity scientists describe it in terms of “feedback loops.” Financier George Soros has described it as “reflexivity.” What I think you think about what I want creates storms of behavior that change what is. Traditional economics holds that the economy is an equilibrium system; that things tend, over time, to even out and return to “normal.” Complexity economics shows that the economy, like a garden, is never in perfect balance or stasis and is always both growing and shrinking. And like an untended garden, an economy left entirely to itself tends toward unhealthy imbalances. This is a very different starting point, and it leads to very different conclusions about what the government should do about the economy. Einstein said, “Make everything as simple as possible, but not too simple.” The problem with traditional economics is that it has made things too simple and then compounded the error by treating the oversimplification as gospel. The bedrock assumption of traditional economic theory and conventional economic wisdom is that markets are perfectly efficient and therefore self-correcting. This “efficient market hypothesis,” born of the machineage obsession with the physics of perfect mechanisms, is hard to square with intuition and reality—harder for laypeople than for economic experts. And yet, like a dead hand on the wheel, the efficient market hypothesis still drives everything in economic policymaking. –The market is always right. –Markets distribute goods, services, and benefits rationally and efficiently. –Market outcomes are inherently moral because they perfectly reflect talent and merit and so the rich deserve to be rich and the poor deserve to be poor. –Any attempt to control market outcomes is inefficient and thus immoral. –Any non-market activity is inherently suboptimal. –If you can make money doing something not illegal, you should do it. –As long as there is a willing buyer and seller, every transaction is moral. –Any government solution, absent a total market failure, is a bad solution. But, of course, markets properly understood are not actually efficient. So-called balances between supply and demand, while representing a fair approximation, do not in fact really exist. And because humans are not rational, calculating, and selfish, their behavior in market settings is inherently imperfect, unpredictable, and inefficient. Laypeople know this far better than experts. –The market is often wrong. –Markets distribute goods, services, and benefits in ways that often are irrational, semi-blind, and overdependent on chance. –Market outcomes are not necessarily moral—and are sometimes immoral—because they reflect a dynamic blend of earned merit and the very unearned compounding of early advantage or disadvantage. –If well-tended, markets produce great results but if untended, they destroy themselves. –Markets, like gardens, require constant seeding, feeding, and weeding by government and citizens. –More, they require judgments about what kind of growth is beneficial. Just because dandelions, like hedge funds, grow easily and quickly, doesn’t mean we should let them take over. Just because you can make money doing something doesn’t mean it is good for the society. –In a democracy we have not only the ability but also the essential obligation to shape markets—through moral choices and government action—to create outcomes good for our communities. You might think that this shift in metaphors and models is merely academic. Consider the following. In 2010, after the worst of the financial crisis had subsided but still soon enough for recollections to be vivid and honest, a group of Western central bankers and economists got together to assess what went wrong. To one participant in the meeting, who was not a banker but had studied the nature of economies in great depth, one thing became strikingly, shockingly clear. Governments had failed to anticipate the scope and speed of the meltdown because their model of the economy was fantastically detached from reality. For instance, the standard model used by many central banks and treasuries, called a dynamic stochastic general equilibrium model, did not include banks. Why? Because in a perfectly efficient market, banks are mere pass-throughs, invisibly shuffling money around. How many consumers did this model take into account in its assumptions about the economy? Millions? Hundreds of thousands? No, just one. One perfectly average or “representative” consumer operating perfectly rationally in the marketplace. Facing a crisis precipitated by the contagion of homeowner exuberance,fueled by the pathological recklessness of bond traders and bankers, abetted by inattentive government watchdogs, and leading to the deepest recession since the Great Depression, the Fed and other Western central banks found themselves fighting a crisis their models said could not happen. This is an indictment not only of central bankers and the economics profession; nor merely of the Republicans whose doctrine abetted such intellectual malpractice; it is also an indictment of the Democrats who, bearing responsibility for making government work, allowed such a dreamland view of the world to drive government action in the national economy. They did so because over the course of 20 years they too had become believers in the efficient market hypothesis. Where housing and banking were concerned, there arose a faith-based economy: faith in rational individuals, faith in ever-rising housing values, and faith that you would not be the one left standing when the music stopped. We are not, to be emphatically clear, anti-market. In fact, we are avid capitalists. Markets have an overwhelming benefit to human societies, and that is their unmatched ability to solve human problems. A modern understanding of economies sees them as complex adaptive systems subject to evolutionary forces. Those forces enable competition for the ability to survive and succeed as a consequence of the degree to which problems for customers are solved. Understood thus, wealth in a society is simply the sum of the problems it has managed to solve for its citizens. Eric Beinhocker calls this “information.” As Beinhocker notes, less developed “poor” societies have very few solutions available. Limited housing solutions. Limited medical solutions. Limited nutrition and recreation solutions. Limited information. Contrast this with a modern Western superstore with hundreds of thousands of SKUs, each representing a unique solution to a unique problem. But markets are agnostic to what kind of problems they solve and for whom. Whether a market produces more solutions for human medical challenges or more solutions for human warfare—or whether it invents problems like bad breath for which more solutions are needed—is wholly a consequence of the construction of that market, and that construction will always be human made, either by accident or by design. Markets are meant to be servants, not masters. As we write, the Chinese government is making massive, determined, strategic investments in their renewable energy industry. They’ve decided that it’s better for the world’s largest population and second-largest economy to be green than not—and they are shaping the market with that goal in mind. By doing so they both reduce global warming and secure economic advantage in the future. We are captive, meanwhile, to a market fundamentalism that calls into question the right of government to act at all—thus ceding strategic advantage to our most serious global rival and putting America in a position to be poorer, weaker, and dirtier down the road. Even if there hadn’t been a housing collapse, the fact that our innovative energies were going into building homes we didn’t need and then securitizing the mortgages for those homes says we are way off track. Now, it might be noted that for decades, through administrations of both parties, our nation did have a massive strategic goal of promoting homeownership—and that what we got for all that goal-setting was a housing-led economic collapse. But setting a goal doesn’t mean then going to sleep; it requires constant, vigilant involvement to see whether the goal is the right goal and whether the means of reaching the goal come at too great a cost. Homeownership is a sound goal. That doesn’t mean homeownership by any means necessary is a sound policy. Pushing people into mortgages they couldn’t truly afford and then opening a casino with those mortgages as the chips was not the only way to increase homeownership. What government failed to do during the housing boom was to garden—to weed out the speculative, the predatory, the fraudulent. Conventional wisdom says that government shouldn’t try to pick winners in the marketplace, and that such efforts are doomed to failure. Picking winners may be a fool’s errand, but choosing the game we play is a strategic imperative. Gardeners don’t make plants grow but they do create conditions where plants can thrive and they do make judgments about what should and shouldn’t be in the garden. These concentration decisions, to invest in alternative energy or not, to invest in biosciences or not, to invest in computational and network infrastructure or not, are essential choices a nation must make. This is not picking winners; it’s picking games. Public sector leaders, with the counsel and cooperation of private sector experts, can and must choose a game to invest in and then let the evolutionary pressures of market competition determine who wins within that game. DARPA (the Defense Advanced Research Projects Agency), NIST (the National Institute of Standards and Technology), NIH (National Institutes of Health), and other effective government entities pick games. They issue grand challenges. They catalyze the formation of markets, and use public capital to leverage private capital. To refuse to make such game-level choices is to refuse to have a strategy, and is as dangerous in economic life as it would be in military operations. A nation can’t “drift” to leadership. A strong public hand is needed to point the market’s hidden hand in a particular direction. In the traditional view, markets are sacred because they are said to be the most efficient allocators of resources and wealth. Complexity science shows that markets are often quite inefficient—and that there is nothing sacred about today’s man-made economic arrangements. But complexity science also shows that markets are the most effective force for producing innovation, the source of all wealth creation. The question, then, is how to deploy that force to benefit the greatest number. Traditionalists say any government interference distorts the “natural” and efficient allocation that markets want to achieve. Complexity economists show that markets, like gardens, get overrun by weeds or exhaust their nutrients (education, infrastructure, etc.) if left alone, and then die—and that the only way for markets to deliver broadbased wealth is for government to tend them: enforcing rules that curb anti-social behavior, promote pro-social behavior, and thus keep markets functioning. Traditionalists assert, in essence, that income inequality is the result of the rich being smarter and harder working than the poor. This justifies government neglect in theface of inequality. The markets-as-garden view would not deny that smarts and diligence are unequally distributed. But in their view, income inequality has much more to do with the inexorable nature of complex adaptive systems like markets to result in self-reinforcing concentrations of advantage and disadvantage. This necessitates government action to counter the unfairness and counterproductive effects of concentration. Where traditionalists put individual selfishness on a moral pedestal, complexity economists show that norms of unchecked selfishness kill the one thing that determines whether a society can generate (let alone fairly allocate) wealth and opportunity: trust. Trust creates cooperation, and cooperation is what creates win-win outcomes. Hightrust networks thrive; low-trust ones fail. And when greed and self-interest are glorified above all, high-trust networks become low-trust. See: Afghanistan. One of the simple and damning limitations of traditional economics is that it can’t really explain how wealth gets generated. It simply assumes wealth. And it treats money as the sole measure of wealth. Complexity economics, by contrast, says that wealth is solutions: knowledge applied to solve problems. Wealth is created when new ideas— inventing a wheel, say, or curing cancer—emerge from a competitive, evolutionary environment. In the same way, the greatness of a garden comes not just in the sheer volume but also in the diversity and usefulness of the plants it contains. In other words, money accumulation by the rich is not the same as wealth creation by a society. If we are serious about creating wealth, our focus should not be on taking care of the rich so that their money trickles down; it should be on making sure everyone has a fair chance—in education, health, social capital, access to financial capital— to create new information and ideas. Innovation arises from a fertile environment that allows individual genius to bloom and that amplifies individual genius, through cooperation, to benefit society. Extreme concentration of wealth without modern precedent that has undermined equality of opportunity and thus limited our overall economic potential. 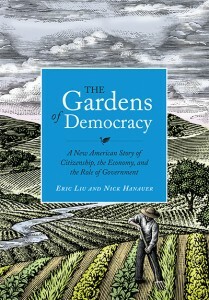 (c) 2011 by Eric Liu and Nick Hanauer. 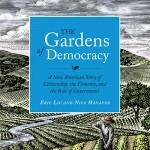 Excerpted from The Gardens of Democracy by permission of Sasquatch Books. If Capitalism Can't Bind People, What Will? Do Markets Make Us Fair, Trusting, and Cooperative, or Bring out the Worst in Us?